The Hults Bruk Akka Forester's Axe is a perfect companion for the wilderness and clearing forest trails. The Akka features a long, curved 24" American hickory handle paired with a 1.5 lb. axe head for exceptional leverage and power in a lightweight package. The straight knife-ground edge and finger notch near the neck make carving tasks a joy. With a total weight of just 2.2 lbs. 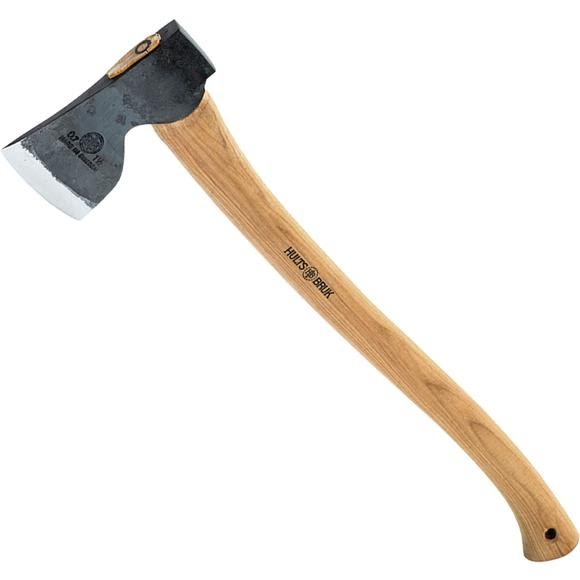 The Hults Bruk Akka Forester&apos;s Axe is a perfect companion for the wilderness and clearing forest trails. The Akka features a long, curved 24" American hickory handle paired with a 1.5 lb. axe head for exceptional leverage and power in a lightweight package. The straight knife-ground edge and finger notch near the neck make carving tasks a joy. With a total weight of just 2.2 lbs. the Akka is is ideal for overnight wilderness trips and fantastic for clearing forest trails. Hults Bruk has been making the world&apos;s finest axes since 1697. Every axe is expertly hand-forged and -crafted, a time-honored tradition preserved by Hults Bruk craftsmen. In 2015, these legendary axes were made available in North America. Overall Length Handle Length: 24"